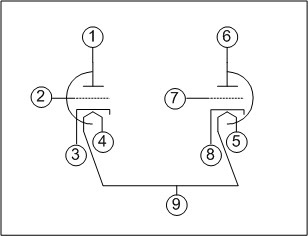 The 12AX7 pinout is shown here. There are 2 independent triodes, 2 plates, 2 grids and 2 heaters. Only the ground wire between the heaters is shared. This results in a 9-pin tube. The cathode resistors and 10uF decoupling cap are wired directly to the tube SOCKET - make sure you have a socket and do not try to solder to the tube legs. Here is a diagram showing the tube socket turned upside down with the tube going into the page. 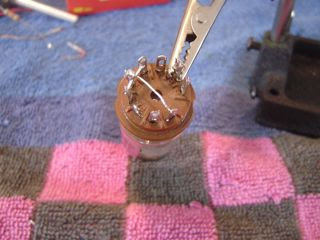 Wire the circuit right at the tube sockets with elements very close to the tube legs. The 2 plates and 2 heater pins are all connected to the +12V line. Wire those first using resistor leads or the like. This means 4 of the 9 pins (almost half of them) are all simply connected together. 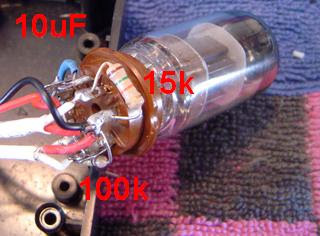 Next, add the 15k, 100k and 10uF decoupling cap. This image shows all three but the 10uF decoupling cap is tucked around the backside of the tube, using blue heat shrink tubing to insulate the legs. You can also see this cap in more detail in the image at the top of the page. 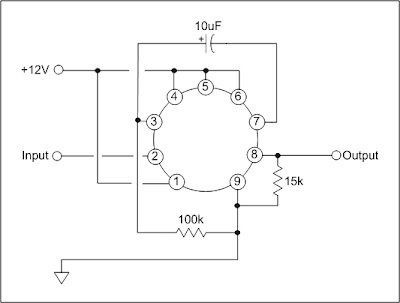 This image shows the input and output wires too, but you don' t need to do that at this stage. 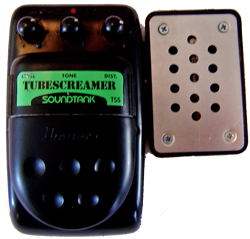 You should now have the tube circuit and the PCB mods ready. Now its time to connect up the sub-circuits and to the final assembly. 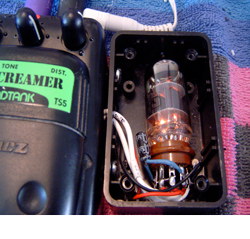 I hope you don't mind, but I'm borrowing the tube setup for a different project. I have noticed, however, that you have the heater wired for 6v operation here. You need to disconnect pin 9, and run pin 5 to ground for 12v.